About this time last year, I ventured out to produce my first audiobook. 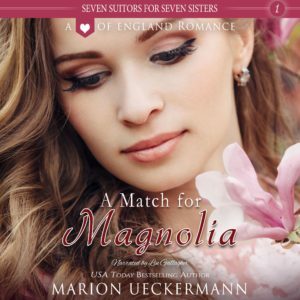 A Match for Magnolia, Book 1 of my Seven Suitors for Seven Sisters, was the story I chose for this endeavor. I first looked into the options of producing myself, then having the book produced, then using ACX.com to produce. Weighing up the high cost of production with a totally unknown return, I set about finding myself a narrator from ACX’s vast database and opted for a royalty split. I’d hoped to be able to quickly move on to an audible Book 2 of this series, then 3, 4, 5. Unfortunately, this doesn’t seem to be on the cards any time soon. As I wanted a different narrator for each sister’s story, an inability to find the right voice for Rose, my Book 2 Blume sister, brought this idea to a grinding halt. And now, with low audiobook sales, I feel I’ve nothing with which to attract the next narrator, and the next, to work with me on a royalty split for the series. So project audio is on hold. For now. Sadly though, I can’t help asking the question: Do readers really want to hear? Personally, I think audiobooks are great, and if done well, so very enjoyable. Have you ever tried listening to your favorite author’s work instead of reading it? Many of your favorite Inspy Romance authors have audio versions of several of their books—Valerie Comer, Autumn Macarthur, Staci Stallings, Heather Gray, Elizabeth Maddrey, and Krista Phillips to mention but a few. Why not try one today? You could begin with any one of our audiobooks and see what it’s like to transform your commute to work or the time spent doing housework into your favorite activity—reading…um, I mean, listening! Audible also boasts an Audible Romance Package, giving subscribers unlimited access to thousands of romance audiobooks. I’m happy to tell you that A Match for Magnolia has been accepted into this package. Just think, you could spend the next 3 hours and 20 minutes enjoying Davis and Magnolia’s romance in the green hills of England. Here’s two short samples for you to enjoy! So what about you? What’s your take on the question of “to hear, or not to hear”? Thanks for sharing. I am *very* careful with the word “love” but I have to say I *love* audio books. I have pretty much all of Leah Atwood’s and Valerie Comer’s. They have been a great joy and comfort, whether I’m riding my bicycle, working, walking, food-shopping, doing household chores, brushing my teeth, showering… :-) I switch between listening to my audio Bibles and inspirational in the course of the day. What a blessing. I really still enjoy listening to Magnolia and Davis’s story! How awesome, Anke. Certainly works for you :) Thanks for sharing. To be painfully honest, I am not an audio book person 😪 I much prefer to read, so I not a big help on this one for you. Sorry! Hi Marion! Thanks for background info on audio books. While I see a purpose for them, at this time in my life I am NOT TO HEAR reader. Since my eyes are aging, there may be a time when I will use audio books, but not while watching my 21 month old granddaughter. Now I would be turning off the book every couple minutes. While reading my ebook, I can put down the tablet or phone and come back in a minute. I did use audio books in my classroom. One of the most memorable was William Golding reading his book Lord of the Flies. After each chapter, he gave personal notes. At the local book club I attend, this month selection was Fannie Flagg’s The All Girls’ Filling Station’s Last Reunion and the author read the book and people really liked her voice and her interpretation. Best wishes and enjoy your weekend. Thanks for your input, Renate. For sure audio books are a personal choice, although sometimes circumstances might make that choice for a person. And definitely they’re for use when one is on your own. Honestly? I don’t prefer audiobooks. I don’t like listening to someone read to me! This goes back to when I was little kid. I didn’t like it when the teacher read to us in class. I didn’t like being read to by my parents. I liked holding the book and reading it for myself. I tried listening to an audiobook before and…well…I simply did not like it! I do have some coworkers who listen to audiobooks during their morning commute and they love it! Unfortunately, I must throw my hat into the “not to hear” ring, also. I have a hearing problem, not so bad that I can’t function without hearing aids, but enough to make listening to audio of any kind without captions too difficult. And anybody with an accent? If I can’t read their lips, I can’t understand enough words to get into the story (even though I love the sound of a British accent, it’s just too hard to understand). I can read much faster than most people talk, anyway. Sorry. I wasn’t into audiobooks before looking into the process for my own stories. Since then, I’ve found I really enjoy them so long as I connect with the narrator. There have been a couple where the voice was not a pleasure to me, and I’ve found kids’ voices are apparently hard to nail, or so it seems! I walk daily for about 45 minutes on our country road, which I’ve now walked tens of thousands of times, so a little diversion is nice. I listen to an audiobook, spend a couple of weeks catching up on my favorite podcasts, then start another audiobook. I’ll also listen sometimes while doing outside chores (weeding, raking leaves). My husband has a long commute and also alternates between audiobooks and podcasts. So, while both of us prefer to actually READ, we’ve both found a place for audiobooks in our lives. Oh, and we sometimes listen to one when on long road trips. Those are usually nonfiction since our taste in fiction doesn’t overlap a lot. The most recent one was Quiet: The Power of Introverts in a World That Can’t Stop Talking. I love that you and hubby have found a place for audiobooks in your lives, Valerie. Gosh, a quiet country road listening to your favorite story…what could be better :) Your latest non-fiction listen sounds terribly interesting. It was fascinating! Jim and I both identify as introverts, so this deep analysis was helpful in confirming that it’s not only “okay” but that the world needs us! In the car, we often hit the pause button and discuss what the author/narrator said, then continue on. I used to read to him in the car. Still sometimes do, but the voice gives out after a while! This works for us. I’m yet to try an audiobook. I loved listening to the sample, Marion! What a beautiful narration, indeed! Oh yes, Lin was fantastic, so whilst I did get two auditions for the next book, she had set the bar high. I also knew what I wanted, and the two auditions were not it. So, I decided to move on for the moment … besides, I’ve had too much on my plate anyway than to still try and produce another audiobook. I must confess, bar my book, I’ve only listened to one Ted Dekker audiobook which I did enjoy. I did get another audiobook from my friend, Nancy Kimbal, and was so looking forward to listening to Chasing the Lion (I had read the book and loved it), but for some or other reason, I couldn’t get the AB to work. I hope you get to try one some time. It appears audio books are biblical… Nehemiah and others, like Moses, recited / read inspirational writings publicly, for people to listen to them. Until I come, devote yourself to the public reading of Scripture, to encouragement, and to teaching. LOL, Anke, I LOVE that!! I’m a recent fan of audio books. I really like to listen while I’m traveling since reading in a moving anything makes me sick. It’s such fun working on audiobooks. Congrats on having so many out, Kimberly. I would love to see my entire series on audiobooks one day. Never tried audiobooks! Am an avid reader though so not saying I won’t try them one day! Hi Marion, I’m sorry this project didn’t pan out the way you had hoped. That must be disappointing and frustrating. I work from home so I don’t have a commute and haven’t listened to an audio book in a long time. You win some, you lose some, Jessica. It was great fun to do it. I just feel bad for the narrator that sales are so low. Maybe one day it’ll catch on, or my audiobook will be noticed, and she’ll make a return on her investment of time. I prefer to read. However, I love audiobooks for when I’m cleaning, exercising, or doing anything that prohibits reading. I don’t listen often enough to justify an Audible account so I check out audible books through Hoopla and Libraries Unbound. I’ve often wondered how authors are compensated by these programs. Anyone here know? Oh, how wonderful, Autumn. So glad you’re managing to get the entire series on audiobook. The time flies when you are driving and a book is on! For sure, Natalya. Hopefully, it’ll happen again for me at the right time. I haven’t tried audio books yet. My step-mother-in-law loves them. She listens while on road trips. I’m thinking they’d be a great way to keep me on the treadmill.